Hardcover: Alfred A. Knopf, 2004; Paperback: Vintage, 2005. Tuberculosis. AIDS. Cholera. Ebola Fever. Influenza. Courtesy of universal international travel, contagious disease today can span the world with lightning speed, in ever-mutating, newly-virulent forms. Might our globalized world be on the brink of a return to the worldwide pandemics of the last century, which once carried off thousands, even millions, of people? Are we all now inhabitants of the Hot Zone? Markel warns that this is still possible—more so than we may think. It is much harder now to track new diseases to their source than it was at the dawn of the modern era of public health. 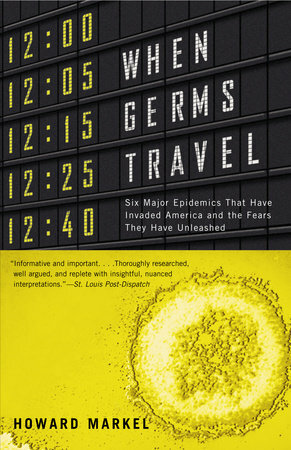 WHEN GERMS TRAVEL tells the story of the meticulous forensic detective work of the dedicated doctors who grappled with disease outbreaks from the late 1890s to the present. These gripping stories will intrigue and enlighten anyone concerned about the other big threat to national security with body counts comparable to world war—contagious disease.